Variations: It almost goes without saying that if you don’t like raisins, simply double the amount of dried cranberries! 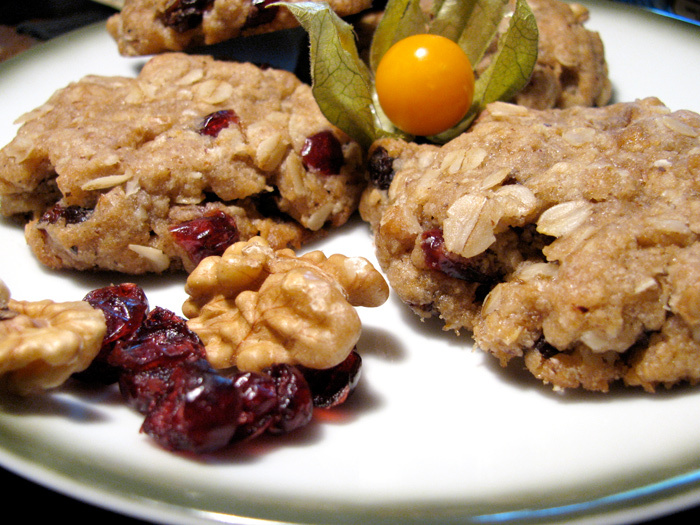 This entry was posted in Sweets and tagged cookies, cranberries, desserts, oats, recipe, sweets, vegan, walnut. Bookmark the permalink. This is so tempting to try. I might try to make them this week. I don’t like sugar so I might even make them without the agave and probably 1/4 cup succanat… Thanks for posting the recipe. You’re certainly welcome! Succanat should work fine. I use unrefined / raw sugar in all my recipes, but nothing too fancy. Enjoy! I have made them ysterday & they were superb! Tasty! Fabuliscious! Oh good! Thanks for letting me know, Sophie. I haven’t made this in a while, and I’m happy to hear others are having good times with them!